Contractors need to be very careful about incurring costs prior to the contract award date. FAR provides a very limited set of circumstances under which precontract costs are allowable. Failure to heed those requirements could render the costs unallowable under Government contracts. in anticipation of the contract award when such incurrence is necessary to comply with the proposed contract delivery schedule. If the costs meet these two criteria, they are allowable to the extent that they would have been allowable if incurred after the date of the contract (see FAR 31.205-32). Contractors contemplating the expenditure of precontract costs are strongly advised (by FAR 31.109) to negotiate an advance agreement with the contracting officer in order to avoid possible subsequent disallowance or dispute based on unreasonableness, unallocability, or unallowability. Advance agreements may be negotiated either before or during a contract but should be negotiated before incurrence of the costs involved. The agreements must be in writing, executed by both contracting parties, and incorporated into applicable current and future contracts. Examples for which advance agreements may be particularly important specifically include precontract costs (see FAR 31.109(h)(4)). CAS 410 - Allocation of Business Unit General and Administrative Expenses to Final Cost Objectives. CAS 410 provides criteria for allocating general and administrative (G&A) expenses to final cost objectives (e.g. contracts) and provides guidelines for the type of expenses that should be included in the G&A expense pool. It also requires that G&A expenses be allocated on a cost input base which represents the total activity of the company. This could well be one of the most contentious of all the CAS standards because it requires a level of judgment to implement. It requires contractors to use judgment on what costs should be included in the pool and it requires the exercise of judgment to devise an "allocation base" that represents the total activity of the company. If the Government doesn't like the allocation methodology it will cite a contractor in noncompliance with CAS 410 (or FAR 15-203(d) - the functionally equivalent FAR requirement that applies to non-CAS covered contractors. This gets a little technical so hold on. G&A expenses must be grouped in a separate indirect cost pool and allocated only to final cost objectives. For an expense to be classified as G&A, it must be incurred for managing and administering the whole business unit. Therefore, those management expenses that can be more directly measured by a base other than cost input should be removed from the G&A expense pool. For example, expenses such as program management, procurement, subcontract administration, G&A expenses incurred for another segment, etc., should not be identified as G&A expenses. They should be the subject of a separate distribution in reasonable proportion to the benefits received. However, immaterial expenses which are not G&A may be included in the G&A expense pool. The G&A expense pool may be combined with other expenses allocated to final cost objectives if the base for the combined pool is appropriate for allocating both the G&A expense pool and the other expenses, and the individual and total expenses of the G&A expense pool can be identified separately from the other expenses. The allocation base for allocating G&A expenses must include any unallowable costs that were charged or allocated to the base. FAR 31.203(d) requires that G&A expenses be allocated to final cost objectives through a base that contains unallowable costs. FAR 31.203(d) states that "all items properly includable in an indirect cost base should bear a pro rata share of indirect costs irrespective of their acceptance as Government contracts costs." Selling costs may be accounted for in the G&A expense pool or in a separate pool. CAS 410 takes a permissive position. CAS 410.40(d) requires a separate allocation of costs, if the costs can be allocated to business unit cost objectives on a beneficial or causal relationship which is best measured by a base other than a cost input base. Therefore, if the inclusion of selling costs in the G&A pool results in an inequitable allocation, auditors should carefully evaluate the selling activities to determine whether selling costs should be separately allocated on a beneficial or causal relationship by a different base. Home office expenses allocated to a segment may or may not be included in the segment's G&A expense pool. The standard states that allocation of line management expenses, residual expenses and directly allocated expenses related to managing and administering the receiving segments are to be included in the G&A expense pool. Separate allocations of home office centralized service functions, staff management of specific activities of segments, and significant central payments of accruals must be allocated to the benefiting cost objective. However, when there is no discernible causal or beneficial relationship with any of the cost objectives, these expenses may be included in the segments G&A expense pool. Any other costs which do not satisfy the definition of G&A expenses maybe included in the G&A expense pool if they were previously a part of G&A and cannot be allocated to final cost objectives on a beneficial or causal relationship best measured by a base other than a cost input base. value-added cost input (TCI less material and subcontract costs) - used where the inclusion of material and subcontract costs would significantly distort the allocation of the G&A expense pool in relation to the benefits received and where costs other than direct labor are significant measures of total activity. single element cost input - used where a single element base (e.g. direct labor hours, direct labor dollars, etc) represents that total activity of a business unit. A single element base is inappropriate where it is an insignificant part of the total cost of some of the final cost objectives. The determination of which cost input base best represent the total activity of a business unit must be judged on the basis of the circumstances of each business unit. CAS 410 permits a special allocation of G&A expenses if a particular final cost objective would receive a disproportionate allocation of G&A expense by using the cost input base. However, the allocation from the G&A expense pool to the particular final cost objective must be commensurate with the benefits received. The amount of the special allocation must also be removed from the existing G&A expense pool and the particular final cost objectives base costs must be removed from the base used to allocate the G&A pool. DFARS (DoD FAR Supplements) was amended today to provide for accelerated payments to all small business concerns. Until now, a small business must have also been "disadvantaged" in order to qualify for the accelerated payment program. Now, the term "disadvantaged" has been removed from the language at DFARS 232.903 and DFARS 232.906(a)(ii), thereby extending this payment policy uniformly to all small business concerns. The basic "accelerated payment" policy is to pay small business concerns as quickly as possible after invoices and all proper documentation, including acceptance, are received and before normal payment due dates established in the contract (see DFARS 232.906(a)). This is an interim rule because it was made without public comment. According to DoD, the action was necessary to ensure DoD implements cash flow improvements for small business firms as quickly as possible. Accelerating payments is a way to boost the financial health of small businesses. There is a two month public comment period, after which the interim rule will most likely become final, without change. Earlier this month, we reported that the Government's Federal Awardee Performance and Integrity System (FAPIIS) was set to go public on April 15th. FAPIIS is an information system that collects contractors' past performance reviews, suspensions, debarments, non-responsibility determinations, and civil, criminal, and administrative proceedings relating to a contractor's performance of federal, state, and local contracts, grants, and cooperative agreements. Contracting officers review the information in FAPIIS when making their responsibility determinations. Information posted after April 15th becomes public record. Information posted prior to April 15 continues to be for offical use only. You can access FAPIIS here. It doesn't require any registration, login ID or password. The program is off to a slow start. So far, there are only two records in the entire database, both involving terminated contracts (one for default, the other for cause). By the way, if you're a contractor, you don't want to see your name listed in this database. Although the FAPIIS contains past performance evaluations which are usually positive, that part of the database is not available to the public. It appears that only negative information will be available. We recommend that contractors periodically monitor it to ensure its accuracy, especially when (or before) submitting proposals to the Government. Erroneous information in this database could affect you chances of winning a bid. Is this the Future for all Government Publications? GSA (General Services Administration) just announced that it will no longer publish the "looseleaf" version of the Federal Travel Regulations (FTR), the regulations that limit the amount of travel costs that contractors can charge the Government (FAR 31.205-46(a)(23)(i)) when traveling within the contiguous United States. Looseleaf pages of the FTR were originally made available at a time when it was the only means to view a change to either regulation in context with the existing text until the publication of the next volume of Title 41 of the Code of Regulations (41 CFR title 41) was published the following July 1. Patrons who maintained the regulations in looseleaf could purchase subscriptions from the Government Printing Office (GPO) and when any change to the FTR occurred, they would be sent the new pages. At best, it could be weeks and even months before patrons would receive the latest changes. With the coming of new technology, GSA began producing these pages and sending them to patrons electronically. Because of today's technologies, those who need and use travel regulations can view and print the latest changes on the day the changes are published in the Federal Register. Even with electronic distribution however, GSA continued to produce the looseleaf pages for these changes while the need for them has become almost nonexistent. GSA finally concluded that the time that it takes to produce the pages for information already available is not an efficient use of government resources and has decided to discontinue the production of the looseleaf versions of the FTR immediately. Today, nearly everything that the Government prints is readily available in electronic format. 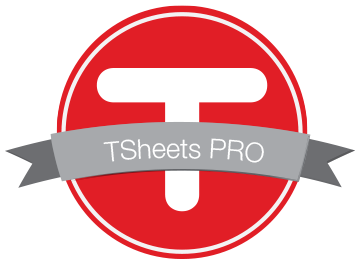 Most businesses needing (or preferring) printed material, simply download and print the file rather than order it and wait for the mail to arrive. According to the draft order, this requirement is all in the name of transparency. All disclosed data is to be made publicly available in a centralized, searchable, sortable, downloadable and machine readable format on http://www.data.gov/ as soon as practicable upon submission. We've written frequently on the subject of defective pricing (Truth-in-Negotiations Act or TINA). Awards based on contractor submission of cost or pricing data are subject to TINA. Under TINA, contractors (or prospective contractors) have an affirmative duty to submit to the Government all factual information that could have a bearing on the contract price. The Government has a systematic program to test contractor compliance with TINA. The larger the contract, the more likely it will be flagged for review. Failure by contractors to furnish the Government all factual data, could lead to contract price adjustments. TINA applies to factual data and information, not contractors use of estimates and application of judgment. Mathematical, clerical, administrative, and accounting errors fall into a gray area. These are netiher factual data nor estimates however the result of these kinds of errors could certainly lead to increases in contract prices. The Government recently issued formal guidance to the effect that accounting, administrative, clerical, and computational errors attributable to underlying cost or pricing data are considered factual information and may result in defective pricing. Although a contractor proposal may contain mathematical errors that would not be considered defective pricing, mathematical errors attributable to the underlying factual cost or pricing data, not just the proposal calculations, can be considered defective pricing. Facts underlying contractor opinions and projections are cost or pricing data; but judgments based on those facts are not. Therefore, errors in estimates i.e. estimated escalation factors, estimated direct labor rates, etc) generally would not result in defective pricing because these estimates represent judgments rather than factual, verifiable data (i.e. cost or pricing data). Under this new guidance, auditors will probably be paying more attention to the accuracy of underlying data supporting contractor estimates. fixed price contracts award on the basis of submission of cost or pricing data. The new proposal, if adopted, will add "fixed-price contracts awarded on a basis other than submission of certified cost or pricing data" to that list. This method and type of contracting is becoming more prevalent as it is now officially "preferred" over contracts awarded based on cost or pricing datas. The impact of this change for small businesses is likely to be beneficial. DoD has approximately three thousand contractors where some form of Government property has been furnished in connection with performing contracts. More than 80 percent of the property (in terms of costs) has been furnished to large businesses. Large businesses however are often in a financial position that enables them to select a high insurance deductible in order to garner lower premiums. Losses under the deductible amount are effectively self-insured for potential property loss. Small companies may not have the financial capacity or capability to select high insurance deductibles and become self-insured up to high thresholds. The probable and natural consequences of lower deductibles is higher premiums. The effect of higher premiums might negatively impact a small businesses ability to compete in full and open competition. This new provision should provide some relief for the small entities concerning costs to acquire insurance against risk of loss. Yesterday we discussed certain criteria that contractors must meet in order for the cost of bonuses and incentive compensation to be allowable under Government contracts. There are some additional requirements for bonuses and incentive compensation that is paid out or based on company stock (e.g., stock options and stock appreciation rights). Costs for these are limited to the fair market value of the stock on the measurement date, the first date that the number of shares awarded is known. If the stock option or stock appreciation price is equal to or greater than the market price on the measurement date, then no costs are allowed for contracting purposes. Payments to an employee in lieu of the employee receiving or exercising a right, option, or benefit which would have been unallowable anyway. Contractors must be very careful that their bonus and incentive compensation plans meet these two criteria. Too often we've seen cases, especially among smaller contractors, where bonuses are paid out on considerations that cannot be defended based on this cost principle. We have discussed "payment recapture audits" quite a bit in this blog. Last December, we highlighted DCAA's activities in support of OMB's payment recapture audit initiative. Now the OMB (Office of Management and Budget) has just issued a revision to Parts I and II of OMB Circular A-123, Appendix C. The purpose of the revision is to implement IPERA (Improper Payments Elimination and Recovery Act), Public Law 111-204. OMB contends that the Federal Government wastes billions of taxpayer dollars on improper payments to individuals, organizations, and contractors each year. These payments are made in the wrong amount, to the wrong entity, or for the wrong reasons. Federal agencies reported an estimated $125 billion in improper payments during fiscal year 2010. "Whether these payments resulted from inadequate record keeping, inaccurate eligibility determinations, inadvertent processing errors, the lack of timely and reliable information to confirm payment accuracy, or fraud, the amount of improper payments is simply unacceptable." Expanding payment recapture audits to all types of payments and activities with more than $1 million in annual outlays (if cost-effective). Improving corrective action plans and incorporating lessons learned from the Recovery Act implementation. Distributing funds recovered through payment recapture audits for authorized purposes. Establishing compliance reviews and requirements for agencies deemed non-compliant. There are a lot of contracting opportunities requiring deployment of contracting personnel to overseas locations. Often these positions are specifically designated as unaccompanied tours meaning that the employees may not bring family members (e.g. Iraq and Afghanistan). However, there are other locations where contractor employees commonly bring family members along (e.g. Germany, Japan, and Korea). When considering overseas employment, the question of education for under aged dependents invariably arises. Will the Government reimburse contractors for the cost of private schools in an overseas location? "Training or education costs for other than bona fide employees are unallowable, except that the costs incurred for educating employee dependents (primary and secondary level studies) when the employee is working in a foreign country where suitable public education is not available may be included in overseas differential pay." Therefore, under certain circumstances, the cost of private education is reimbursable. However, we recommend that contractors faced with this situation, enter into an advanced agreement with the contracting officer as provided for in FAR 31.109. This might preclude arguments later on as to whether available public education is "suitable" or not. Uncompensated overtime is hours worked in excess of 8 hours a day or 40 hours per week by salaried employees who are paid a fixed amount per week, month or year regardless of the number of hours worked. The terms "uncompensated overtime" or "unpaid overtime " are really misnomers however, since the salaries of exempt employees under the FLSA are considered compensation for all hours worked. An inequity in the costing of Government contracts could occur if uncompensated overtime is worked, but not accounted for, and more than one contract or project is worked on by the salaried employee. The lack of proper accounting for the overtime hours can create the potential for contractors to manipulate its labor accounting system. The Government always prefers that contractors implement timekeeping and labor distribution systems that properly accounts for all hours worked. Some contractors have not done so, sometimes because the occurrence of uncompensated overtime is insignificant. Where contractors have not done so, auditors will conduct testing to validate the contractors' assertions. Auditors will expand floorchecks or employee interviews to determine whether the failure of the contractor to record all time worked results in a material difference in the charging of costs. Uncompensated overtime can increase contractor profits, especially on a fixed-price contract which was bid on the basis of a 40-hour week and employees are either required to work uncompensated overtime or they voluntarily do so. Contractor profits increase because for every additional uncompensated overtime hour per week an employee works, a lower effective hourly rate is paid by the contractor. That practice can also cause problems if the contractor wishes to use history to bid fo1low-on contracts. The DoD Inspector General's office has published six fraud indicators related to uncompensated overtime that auditor's are required to consider when auditing labor costs. Although auditors are not responsible for proving fraud, they are responsible for finding and reporting fraud indicators. Fraud indicators are not fraud. However, by looking for fraud indicators and properly assessing them during an audit, the auditor is taking the proper approach to uncovering fraudulent acts and, thereby, protecting the Government's interests. Professional staff required to work a significant amount of unpaid overtime on a variety of projects-both direct and indirect. Salaried employees only charging the first 8 hours worked during any day for an extended period. A pattern of management directed unpaid overtime with employee bonus based on the extra hours worked. Cost-type Government contracts worked during the first 8 hours and fixed price or commercial contract work performed only during the unpaid hours. Overrun contracts/projects worked on only during unpaid hours. Encouraging employees to work significant unpaid overtime but to not record the hours in direct conflict with company policy. Contractors should periodically perform their own self-assessments (internal audits) of their timekeeping and labor distribution policies, procedures, and practices to ensure they are in compliance with sound Governmental contracting and accounting practices. Its interesting once in awhile to look back at FAR cost principles that have been deleted and to determine the Government's reasoning behind the decision to remove them. One such deletion that recently caught our attention was FAR 31.205-5, Civil Defense Costs (we were briefing a very old contract). According to the now deleted FAR 31.205-5, civil defense costs are those incurred in planning for, and protecting life and property against the possible effects of enemy attack. Costs related to civil defense measures, such as costs in excess of normal plant protection costs, first-aid training and supplies, fire fighting training and equipment, posting of additional exit notices and directions, and other approved civil defense measures undertaken on the contractor's premises pursuant to suggestions or requirements of civil defense authorities were allowable when allocated to all work of the contractor. Contributions to local civil defense projects however were unallowable. In 1998, the FAR councils reasoned that with the end of the Cold War, the special guidance provided in the cost principle was no longer necessary so they removed it. In removing the guidance, the FAR councils stated that the acceptability of this type of costs would henceforth be governed by the "catch-all" allocability, allowability, and reasonableness criteria discussed in FAR Part 31. FAR 31.205-19, Insurance and Indemnification, provides fairly comprehensive coverage on the allowability and unallowability of various types of insurance. Coverage that the contractor is required to carry under the terms of a contract or coverage maintained in connection with the general conduct of its business are generally allowable. Of course, types and extent of insurance must follow sound business practices and the rates and premiums must be reasonable. Section (e)(3) of this cost principle however makes the cost of insurance to protect contractors against the costs of correcting its own defects in materials and workmanship, unallowable. This prohibition has been around since 1981 and is based on Public Law 97-12. However, while insurance for these activities are unalloable, the cost of the activities themselves may be allowable. FAR 31.205-39, Service and Warranty Costs states that costs arising from fulfillment of any contractual obligation of a contractor to provide services such as installation, training, correcting defects in the products, replacing defective parts, and making refunds in the case of inadequate performance, are allowable when not inconsistent with the terms of the contract. So it would seem that service and warranty costs are generally allowable but the purchase of insurance to cover a contractors liability for service and warranty costs are not allowable. Yesterday we discussed CAS 403 and how "residual expenses" exceeding a certain threshold, must be allocated to segments over a three factor formula that includes payroll dollars, operating revenue, and net book value. Over the past few years, the CAS Board has received unsolicited proposals to increase the thresholds which haven't changed since the CAS 403 was promulgated 35 years ago. One proposal recommended that the thresholds be tied to the CPI (Consumer Price Index). The CAS Board published a "Staff Discussion Paper" in the Federal Register requesting comments on that approach. Three comments were received. Two were in favor and the third recommended that the board conduct more research. The expressed concern is that the proposed thresholds are so high that possibly no contractor would meet them. 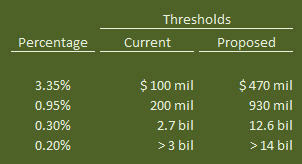 The following chart compares current and proposed thresholds. This matter does not appear to be high on the Board's priority list. In fact, nothing seems to be very high on their priority list since they had only two meetings in 2010 and made no decisions. CAS 403 - Allocation of Home Office Expenses to Segments. The purpose of CAS 403 is to establish criteria for allocating home office expenses to the segments of the organization on the basis of a beneficial or causal relationship. A home office is one that is responsible for directing or managing two or more but not necessarily all segments of an organization (CAS 403.30(a)(2). This definition includes intermediate levels of home offices such as group organizations which report to a common home office. An intermediate level may be both a segment and a home office. In the context of CAS 403, there are three types of home office expenses. Expenses that have a clear relationship (i.e. measurable with reasonable objectivity) to two or more segments. Residual expenses which possess no readily measurable relationship to segments. Expenses that are incurred for specific segments are to be allocated directly to those segments to the maximum extent practical. Expenses that are not directly allocable, but possess an objective measurable relationship to segments, should be grouped in logical and homogeneous expense pools and distributed over allocation bases reflecting the relationship of the expenses to the segments concerned. These allocations, to the extent practical should minimize the amount of expenses which may be categorized as residual expenses. CAS 403 provides a few examples of home office expenses and suggested methods for allocating or assigning these costs to segments. Centralized service functions are to be allocated to segments on the basis of the service furnished to or received by each segment. Examples include centrally performed personnel administration and centralized data processing. Staff management or policy guidance functions shall be allocated to segments receiving more than a minimal benefit over a base (or bases) representative of the total specific activity being managed. Line management shall be allocated only to the particular segment or group of segments which are being managed or supervised. Central payments or accruals shall be allocated directly to segments to the extent that all such payments or accruals of a given type or class can be identified specifically with individual segments. Examples of central payments include pension, insurance, state and local taxes, payrolls, etc. Residual Expenses. The method for allocating residual expenses is a two part process. First, there is a formula for determining whether residual expenses are material. If material, residual expenses must be allocated to segments over a three-factor formula. If not material (in the context of CAS 403), residual expenses must be allocated to all segments by means of a base representative of the total activity of such segments. To determine materiality, take the residual expense pool and compare it to the aggregate operating revenue of all segments, factored as follows: 3.35 percent of the first $100 million, 0.95 percent of the next $200 million, 0.30 percent of the next $2.7 billion, and and 0.20 percent of amounts over $3 billion. If residual expenses exceed this amount, contractors must allocate the expenses over a three-factor formula. The three-factor formula consists of payroll dollars, operating revenue (net of interdivisional purchases), and average net book values of tangible capital assets and inventories (net of progress payment billings). Regardless of the method, there may be instances where a particular segment receives significantly more or less benefit from residual expenses than would be reflected by the allocation of such expenses pursuant to the standard. In these cases, a special allocation may be agreed to by the parties provided such special allocation is commensurate with the benefits received (CAS403.40(c)(3)). Today we conclude our short series on past performance assessments. In theory, the Government prepares past performance assessments on completed contracts. These assessments are crucial to the integrity of the past performance system. Contracting officers and source selection officials rely on current information on contractors' performance when determining responsibility and deciding to award new contracts. The quality of these assessments is also important in providing useful and meaningful information to source selection officials. OFPP found that the reports generally lacked sufficient information to support the ratings. For example, most assessments did not include details about how the contractor exceeded expectations or corrected poor performance. Additionally, many of the assessments did not include ratings for one or more of the four performance areas. For one agency, the adequacy rate was only six percent. The best agency achieved only a 63 percent adequacy rate. The OFPP report has already had an impact. DoD for example is strengthening its guidance and management controls to improve the collection of useful and timely past performance information. It is also increasing oversight to monitor both compliance and quality. Always check any CPAR evaluation to ensure that it is a “proper and just” rating and that it reflects your actual performance. If you believe the rating is inaccurate, object in writing to the contracting officer and specify the areas that you believe are inaccurate and what the ratings should be. If you are not satisfied with the action taken by the contracting officer, always appeal to the proper authorities above the contracting officer. Remember that one inaccurate bad rating can jeopardize your entire contracting future. Supporting narrative rationales for all performance ratings assigned are mandatory in DoD. The narratives are critical to any PPI assessment and necessary to establish that the ratings are credible and justifiable. These rationales need not be lengthy. But if there were performance successes or problems, they should be documented. Include a description of the problems or successes experienced; an assessment of whether the problems were caused by the contractor, the Government, or other factors; and how well the contractor worked with the Government to resolve the problems (including problems with subcontractors or “partners” in joint venture or teaming arrangements). The narrative rationale is also useful in future acquisitions; it helps assessing officials to establish the relevancy of the work covered to the instant requirement. It is critical that contractors take the time to review and comment on the Government's "view" of their past performance. Even if the information doesn't sound too bad, it could be injurious to future success if the competition sounds less bad. For example, if a contractor's past performance is rated "satisfactory" (met all contract terms and conditions) but the competition is rated "exceptional", the competition will be rated higher in this area and that might be all it takes to differentiate the successful offeror from the rest of the pack. Contractors should be especially sensitive of situations where there were mitigating circumstances or where the Government might have contributed to a particular situation. There are five performance ratings. Do not settle for anything less than "exceptional". Exceptional - Performance meets contractual requirements and exceeds many to the Government's benefit. The contractual performance of the element or sub-element being assessed was accomplished with few minor problems for which corrective actions taken by the contractor were highly effective. Very Good - Performance meets contractual requirements and exceeds some to the Government's benefit. The contractual performance of the element or sub-element being assessed was accomplished with some minor problems for which corrective actions taken by the contractor were effective. Satisfactory - Performance meets contractual requirements.The contractual performance of the element or sub-element contains some minor problems for which corrective actions taken by the contractor appear or were satisfactory. Marginal - Performance does not meet some contractual requirements. The contractual performance of the element or sub-element being assessed reflects a serious problem for which the contractor has not yet identified corrective actions. The contractor's proposed actions appear only marginally effective or were not fully implemented. Unsatisfactory - Performance does not meet most contractual requirements and recovery is not likely in a timely manner. The contractual performance of the element or sub-element contains serious problem(s) for which the contractor's corrective actions appear or were ineffective. Last week, we discussed the impending public roll-out of FAPIIS (Federal Awardee Performance and Integrity Information System). Any data posted to this database after April 15th will become publicly accessible except for "past performance" information. Today we will look at the Government's policies and procedures relative to contractor performance information, most of which can be found in FAR 422.15. Past performance information is used by the Government for future source selection purposes and, as the name implies, is documentation of a contractor's actions under previously awarded contracts. In includes, for example, the contractor's record of conforming to contract requirements and to standards of good workmanship, the contractor's record of forecasting and controlling costs; the contractor's adherence to contract schedules, including the administrative aspects of performance, the contractor's history of reasonable and cooperative behavior and commitment to customer satisfaction; and generally, the contractor's business-like concern for the interest of the customer (i.e. the Government). Agencies are required to prepare evaluations of contractor performance for each contract that exceeds the simplified acquisition threshold (currently $150 thousand) at the time that work under the contract is completed. There are a few minor exceptions. For larger contracts, Government agencies are encouraged to prepare interim evaluations as well. The content of past performance information relies on input from technical, contracting, and end users of the product or service. Although there is not a specific requirement to have contract auditors contribute to the assessment, audit reports (especially negative audit reports) have a way of becoming part of the assessment. Agency assessments must be provided to the contractor as soon as practicable after completion of the evaluation. Contractors have at least 30 days to review and submit comments, rebutting statements, or additional information. Disputes are adjudicated at a level above the contracting officer however the ultimate conclusion on the performance evaluation is a decision of the contracting agency. All agencies are required to retain the initial evaluation, contractor response and review comments as part of the evaluation. Evaluations are used to support future award decisions and are considered "source selection" information. That means that this data is not released to other than Government personnel and the contractor whose performance is being evaluated. Disclosure of such information could cause harm to both the commercial interest of the Government and to the competit5ive position of the contractor being evaluated as well as impede the efficiency of Government operations. Past performance information is retained for three years after completion of contract performance. Here's an update to our previous posting on the Government's intentions to make information posted to the FAPIIS (Federal Awardee Performance and Integrity System) publicly available. FAPIIS is an information system that collects contractors' past performance reviews, suspensions, debarments, non-responsibility determinations, and civil, criminal, and administrative proceedings relating to a contractor's performance of federal, state, and local contracts, grants, and cooperative agreements. Contracting officers must review the information in FAPIIS when making their responsibility determinations. To support this purpose, initially the information in FAPIIS was only available to the contractor, government personnel, and authorized users performing business on behalf of the government. Last January, the FAR councils rolled out a proposal to make any data posted to FAPIIS after April 15, 2011, publicly available. The 60 day comment period ended on March 25th and public comments have now been posted to Regulations.gov. There were about a dozen responses to the proposal. A couple respondents thought the whole thing was a bad idea and wanted the proposal dropped. Those comments are not going anywhere because giving the public access to the FAPIIS database is statutorily required. The comments that resonated most with us had to do with the giving contractors the ability to review any data prior to public posting in order to ensure that company proprietary data and information is not being improperly disclosed. Propriety data is not supposed to be disclosed anyway but deciding what data is proprietary and what data is releasable requires judgment and a contractors judgment may differ from a Government employee's judgment. One commenter proposed that all data be made public, not just information posted to the database after April 15th. Contractors can see what information FAPIIS currently contains about themselves by filing a FOIA (Freedom of Information Request) with GSA (General Services Administration).